FREE RV Solar Guide Download - Learn how to skip costly RV Solar Mistakes. Our RV Solar Guide is available for your use in planning and calculating your Solar battery charging system. Remember that operating on an off-grid charging system is a lot like balancing a checkbook: the more you put into your account, the more you can use. The more amps from your panels will mean more solar energy and faster recharge times for your batteries. A proper charge controller or regulator will allow you to charge deep cycle marine, gel, and AGM batteries. This controller will also keep from overcharging your batteries. We hope to have provided you with our top selection of kits to get you producing electricity as quickly as possible. Visit our informational page so you can also learn about the parts and functions of the solar kits for your RV. 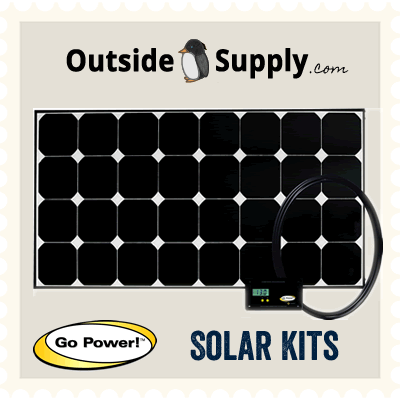 Many of the kits we carry are from Go Power which we consider tops in the RV and Marine off grid charging space. Steve L. from Oregon was looking for a solar charging setup for his Class A motorhome. He wanted an easy to install a charging system to do quite a bit of off-grid camping while traveling to remote locations across the country. After determining his power needs, we looked at the open spaces on the roof of his RV. His unit had a large open section of roof that would easily accommodate the 480 watts of solar we recommended. This included 3 of our 160 watt Go Power Panel Kits. The roof did not have any obstructions to get in the way of the install. The mounting brackets that came with the panels worked great and the refrigerator chase allowed for an easy installation of the wires down to the charge controller inside. After a complete installation, he gets 26+ amps of charging during most of the day. Great solution for a customer out seeing the world! Producing electricity everyday when the sun shines is a great feeling. Using the power produced by your PV is a great way to increase your overall enjoyment when camping miles from the nearest power pole. While no solar power system is going to have enough power to do everything that you would like to run, it can provide enough to get many items run to meet your needs. When shopping for a kit for your RV it is important to purchase equipment that is designed and warrantied to be installed on your vehicle. We have many rooftop mount kits that include the wire with MC4 connectors, RV roof mounting brackets, standoffs, mounting hardware, and installation instructions. If you would prefer a more portable solar charging system take a look at our Portable Solar Kits! Our kits work on many brands and types of travel trailers, campers, teardrops, Pop Ups, Class A , Class C, Motorhomes and other remote uses. It is the small details like mono-crystalline high-efficiency cells and quality engineering that will make a great system that will last you for years of boondocking or even the occasional night in a Walmart parking lot; yes this will happen when you hit the road. We can also provide tricks and tip for installing on rubber roofs, cable entry systems, routing wires through refrigerator or AC chase.